The official cash rate remains at 1.5%. The move was highly expected. 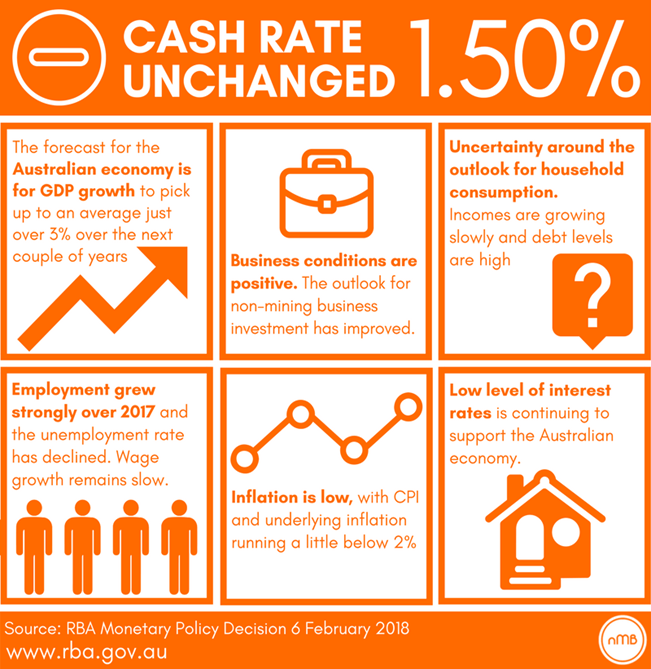 In finder.com.au’s survey on the March cash rate decision, all its 33 members believed the central bank would leave the rate on hold. In a survey of brokers, Hashching found that 93.9% believed the interest rates would remain on hold in March, with 5.3% expecting an increase. More economists and banks are changing their forecasts of interest rate hike this year – from two to one or none. CoreLogic head of research, Tim Lawless, said the controlled slowdown in housing markets has eased pressure on the RBA to lift rates in order to quell exuberance in the housing market. “Higher on the RBA Board’s agenda are likely to be inflation and employment. Continued low wages growth (2.1%), and the outlook for the Australian dollar and commodity prices will also be important considerations,” said Lawless. AMP Capital’s Shane Oliver said that continuing weak growth in wages, sub-target inflation, the Australian dollar remaining too high, and uncertainty around the outlook for consumer spending all argue for rates to remain on hold or even fall. “So on balance, it makes sense to continue to leave interest rates on hold,” said Oliver.